In this article, we introduce a novel method of quantifying pump station energy efficiency. 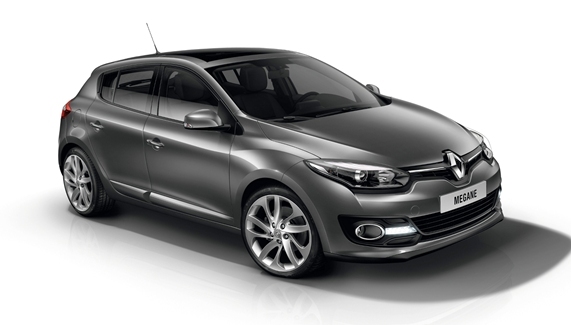 For an automobile, everyone is familiar with Miles-Per-Gallon or MPG. 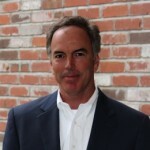 Today, we are going to introduce an equivalent measure of pump station efficiency that every water utility Telemetry/SCADA system should include: GPK. Using the EtherMeter, a VFD (Variable Frequency Drive), and a Flow Meter to Optimize Pump Station Energy Efficiency. Have you ever calculated the average gas mileage for your automobile? It’s fairly simple ― At two successive fuel tank fill-ups, check the odometer, and calculate the difference in miles: Delta-Miles. Then, after the last fill-up, note the amount of fuel added: Delta-Gallons. 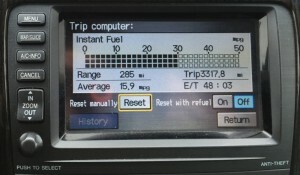 Note that the above measurement provides an average MPG achieved throughout the previous tank of fuel. Note that the above measurement provides an average GPK achieved throughout some fixed time period. 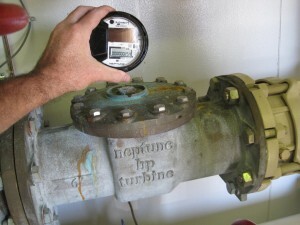 Example Flow Meter: Neptune HP Turbine, 6 Inch, with E-Coder Register. 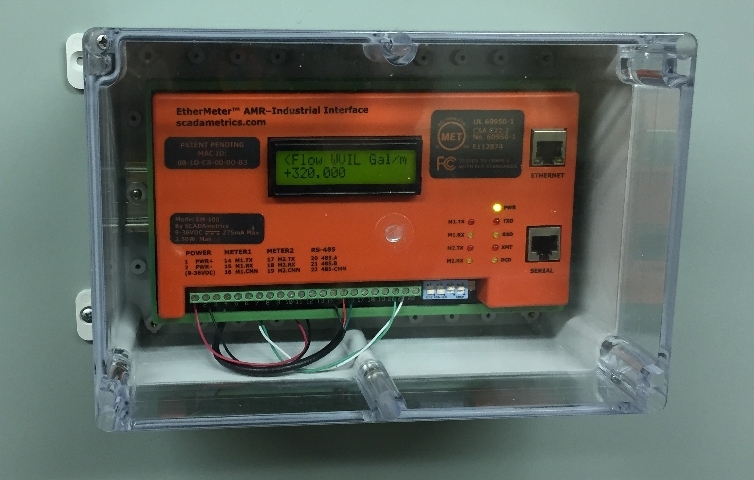 EtherMeter: Connects Neptune HP Turbine Meter to Station Control System via Modbus/RTU (via RS-485 twisted pair). 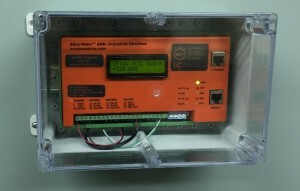 Allen Bradley PowerFlex VFD’s – Connected to Station Control System via Modbus/RTU (via RS-485 twisted pair). 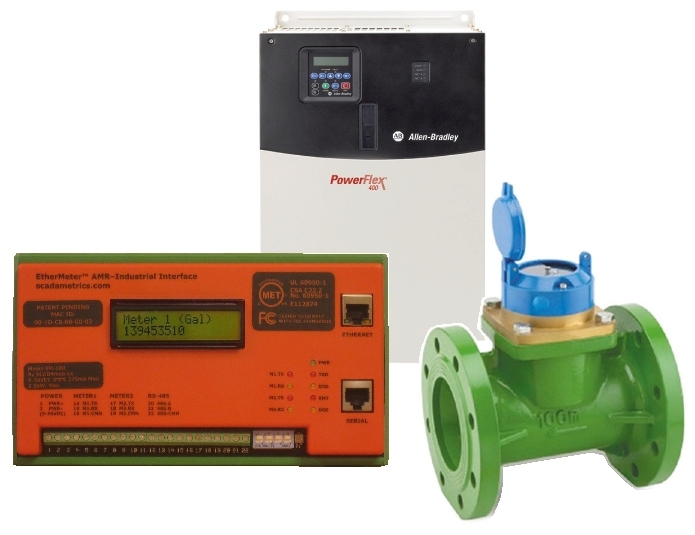 Therefore, a connected PLC or SCADA system can collect these measurements ― using Modbus, DF1, or EtherNet/IP™ ― to provide a running display of Pump Energy Efficiency. 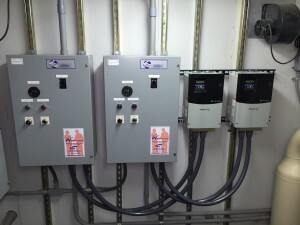 Example Pump Station Modbus/RTU Network. Why is this measurement important? 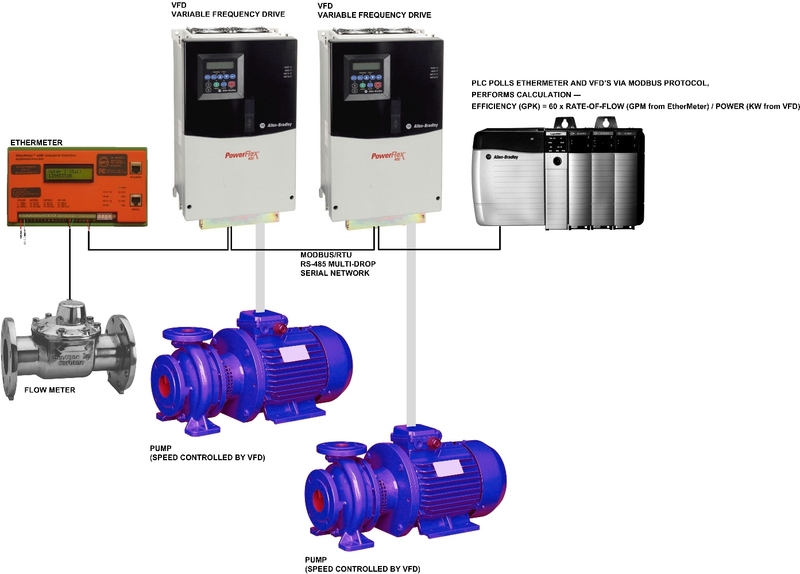 Because when pump speed ― and therefore flow rate ― is reduced and optimized by controlling a VFD’s output frequency, pipeline friction losses are reduced. And since friction losses are proportional to the flow-rate squared, reducing the flow-rate by even a modest factor may yield significant energy savings. In an extreme example, reducing flow-rate by a factor of 2 will reduce pipeline friction losses (wasted energy) by a factor of 4. In a successful real-world application, we recently observed a Water Utility who was able to reduce its average pump energy consumption by a factor of 3! 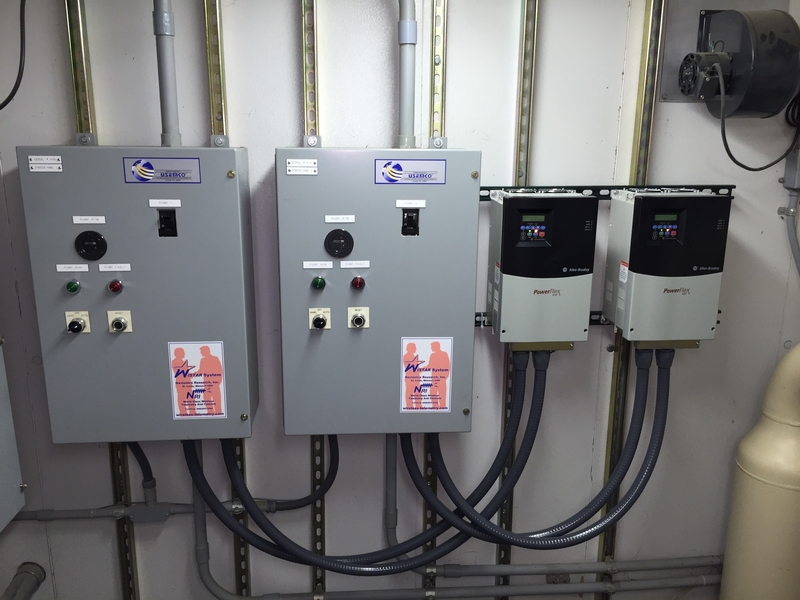 In this project, the customer replaced soft-starters with VFD’s and leveraged a Flow Meter/EtherMeter combination to optimize the rate-of-flow and GPK. Before the introduction of the VFD’s, the pumps were only capable of running at 100% speed ― typically pumping at a flow rate of 352.3 GPM ― with an average efficiency figure of 1328 GPK. After the VFD’s were installed and optimization completed, a new average rate-of-flow was set at approximately 169.34 GPM ― yielding a new average efficiency figure of 4033 GPK. At the time of this writing, the cost per a Kilowatt-Hour is generally around $0.12, so the pump station’s energy costs were calculated to drop from $345/month to $114/month! Pump “Gallonage” (GPK) – 24 Hour History Chart (above). Note that the GPK can spike up during pump ramp-up and ramp-down — This is normal. Also, Rockwell Automation offers a useful tool in the form of an online energy savings calculator. Thanks for the article. 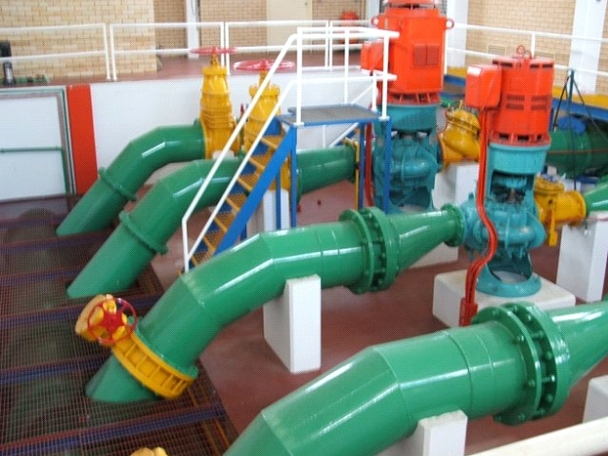 We didn’t examine pump station’s efficiency from this view yet. Very interesting!